Happy New Year to all! This site is happy to bring you the first photos of 2006 of the World’s Tallest Water Sphere. 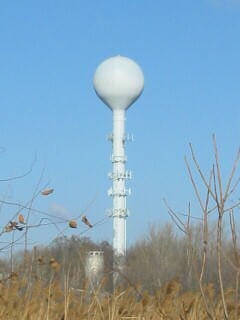 The author was lucky enough to take a trip to Union on 2005-12-27 and take some photos of the water sphere. More photos to come soon in an upcoming photo essay. In the mean time, here is the Union tower in its nearly white paint scheme. Note the barely visible Union lettering on the left side of the sphere. This was a cold, crisp day, about 40 degrees Fahrenheit (4 Celsius) – perfect for viewing and photographing from David Terrace on the edge of Kawameeh Park. Click on the photo for a larger view. This entry was posted on Sunday, January 1st, 2006 at 8:40 pm	and is filed under Photos. You can follow any responses to this entry through the RSS 2.0 feed. Both comments and pings are currently closed. Where is the 8 MP version? Currently we only have the 640×480 pixel photo versions offered in the article. We are looking to offer larger print-ready sizes as we determine the room needed to supply the big photos.